Thinsulate insulated Waves Kup Kollar in plastic bag. Founded by Jason Burton, The LAB connects specialty beverage companies with consumers through social media, public relations, and networking. LAB team members share beverage news and create unique marketing solutions for the industry. They plan events and travel to cities across the country. Last weekend The LAB team came to Boulder, Colorado for a Caffeine Crawl. 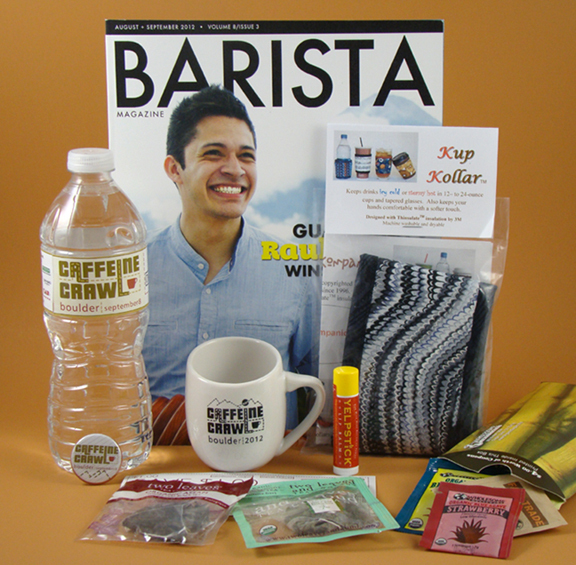 Each person received a goodie bag with a Barista magazine, water bottle, Caffeine Crawl button pin, cute mug, Two Leaves and a Bud teabags and coupon, Wholesome Sweeteners and coupon, Yelpstick lip balm, and a raffle ticket. Koffee Kompanions added a Kup Kollar cup wrap! The crawl walkers gathered at 13th and Pearl Street between 10:00 and 10:30 am. The weather was Colorado perfect! These kool red tennis shoes led our group for about 5 hours of adventure and fun! Jason of the kool tennis shoes, used his phone to shoot photos, keep in touch with the other tour guides, and receive game information about his 5 year old son's first soccer game. Having stood on soccer field side lines for many games played by my daughter and son, I shared his excitement when he read that his son had scored a goal! Jason, clip board in hand, explained the drill. The aloof man wearing black is Kent. He and Naomi led two other groups of crawl walkers. Sean and Colleen helped carry our goodie bags and my backpack. Colleen used her phone to send photos to her friends and tell them where she was along the Crawl route. It was time to move down Pearl Street to our first stop. 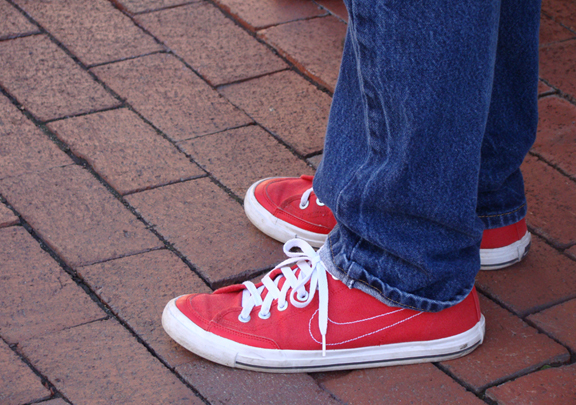 The kool red tennis shoes were on the move! Enjoy more 2012 Boulder Caffeine Crawl photos!